First: a word about kookaburras. 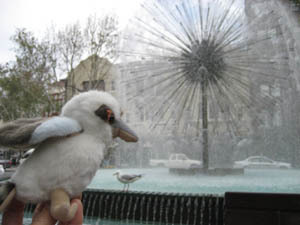 Every place I went in Australia for endurance, the noisy birds were there, parrots, plovers, ibis, magpies, whip birds (whip-CRACK! is their call), and kookaburras, colorful, loud, impressive. For being such mild-looking birds, the kookaburras are LOUD. You know those jungle movies where you’re led to believe that the loud OOH OOOH OOOH OOOH! AAAH AAAH AAAH AAAH! cries are monkeys? Those are kookaburras. If you want to know what it’s like to be wakened by kookaburras, go to http://www.nationalparks.nsw.gov.au/npws.nsf/Content/The+laughing+kookaburra click on What the kookaburra sounds like in the middle of the page, turn up the volume on your speakers at full, put them right by your ears, then hit the Play button. Better yet, have somebody else do this while you are sleeping, and you’ll know the full meaning of a kookaburra alarm clock. I didn’t really have much time to be a tourist in Australia, but if I had, maybe I could have done this. I could have flown to Townsville (wherever that is) for a $50 cup of coffee at Hervey’s Range Heritage Tea Rooms. It’s a delicacy: a Kopi Luwak from Indonesia, a cat-like Palm Civet, eats ripe coffee beans, poos them out, the do is collected, the beans are collected from the poo, and washed, roasted and quarantined. The coffee is purported to be a “divine full-bodied blend with a hint of chocolate flavor.” But regrettably (? ), I didn’t have time for this. I had a day to wander Sydney, staying in the character-full Kings Cross district. Sydney’s a lovely city on Sydney Harbour, and the well-known symbols of the city, the Opera House and Harbour Bridge are indeed quite striking. 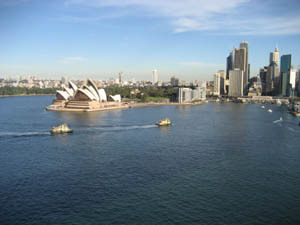 I didn’t want to climb the Harbour Bridge (and certainly not for $170), but I did walk across it. I’ve mentioned the amazing birds and parrots all over the country several times, and in Sydney, in the lovely Botanical Gardens, (a highlight), there was no shortage of parrots, especially cockatoos, which you could get quite close to. In fact, if you are daring enough to hand seeds to them (I was not), some will come right up to you. 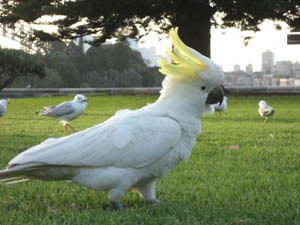 Or, if you happen to be kneeling on the grass, bending over to look through your camera’s viewfinder as you are shooting a cockatoo 2 feet away, another one might fly up and land on your back, and start pulling at your ponytail band, at which point you slightly shrug and cringe, hoping the bird will not find your earrings and rip them out of your ears. Now, I was feeling a little bereft (still) without the Raven, so, I picked up a little kookaburra (what else), one that makes the call when you squeeze it. 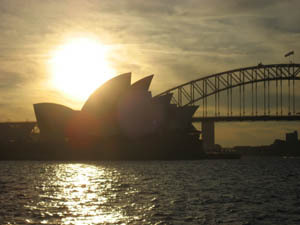 I took a couple of pictures with it in Sydney… it’s just not the same. While I haven’t yet found the Raven, this isn’t quite the end of the story… (stay tuned).